Well, one thing I’m getting into is lacto-fermenting foods. 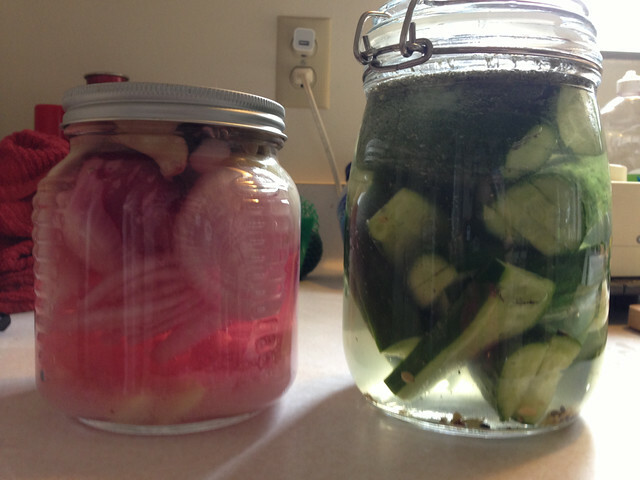 Here’s a pic of some garlic and red onions, and some cucumber pickles. It’s very good for one’s tummy to get some of those probiotic bacteria in there. And it doesn’t taste too bad. Helps the digestion. They say a happy belly leads to a happy mind, the gut being the second brain and all that. Anyway, I recommend it. I still haven’t gotten very good results with my water kefir grains, but hopefully soon. But really, fermenting myself is what I’m doing. I realized I haven’t written much because I am just kind of treading water or floating or…something. I’ve been having a midlife crisis since like third grade, so now that I’m actually…da da da dum…forty seven years old, I think I might be having a midlife crisis for real, but I don’t know how it’s so different from every other time in my life. I took a part-time job working with autistic kids and the company is new so things are kind of flippety-floppety in terms of training and other administrative stuff. It bugs me. It’s also hard work–I have four clients–funny calling little kids clients, huh? Well, they are really great except when they are melting down and I don’t know what to do. But I’m just trying to be okay with that. I want to be able to say, “I love it! this is my next career. I’m no longer lost or confused. I’m focused, ambitious, on a path.” But I can’t say that. I just don’t know. Sometimes I just want to stay home and do nothing and sometimes I really like the job. I don’t trust myself to even know what I want to do. I want my husband to get really rich so I can live off of him!! Haha though, I don’t know if I’d ever be able to do that. As a little girl in the women’s movement of the 1970s I committed to being independent fully forever. No one was going to have me under his thumb like all the grown women I knew. This is a truth that is way deep for me. I don’t know if it’s true. Maybe it’s false and just another tentacle of the “don’t ever trust anyone ever” monster that lurks in my subconscious mind. I don’t know. Anyway, he probably won’t get rich enough to support both of us in the lavish fermented foods style we’ve grown accustomed to anyway. So…I am fermenting. Trying not to worry about money. Not to work more hours just for money. Not to worry about financial dependency. Trusting that I will know what to do next whenever next gets here. I keep forgetting that I had to quit my more than full-time teaching career because of fibromyalgia and chronic fatigue, and that what I am fermenting, is a new life where I stress less and have fewer symptoms of exhaustion and pain. This is what’s in my jar. I can wait for it. This entry was posted in cooking, paleo primal low carb cooking and tagged awareness, care of the self, career, cucumbers, ease, fermentation, fermenting, home fermenting, lacto-fermenting, midlife crisis, onions, relaxation, sandor katz by Project Easier. Bookmark the permalink. Wonderful post! (And I hadn’t thought to ferment red onion. I just moved the large red onion I have to the counter so I’ll remember to start it tomorrow morning.) I had my mid-life crisis almost 10 years ago when I was about 36 (I was precocious). At some point, I found worrying simply too exhausting and I started worrying less (it certainly still comes and goes though). It wasn’t a conscious decision. I just became fed up with it. Thanks so much! I too got fed up with worrying, and am much less worried these days. Maybe it’s all the probiotics I’ve been eating that have lessened my anxieties! Being precocious has always seemed a good thing to me, smart and ahead of the game😄. :O It totally is the probiotics! I hadn’t linked the two, but I keep telling people that ferments reduce anxiety. I hadn’t thought about my own anxiety though! Thank you!